Companies using Microsoft technologies from ERP to CRM, SharePoint, or SQL. TARGIT Decision Suite is the business intelligence and analytics solution for all business users. With an emphasis on people, it is our mission to transform entire organizations by revealing actionable insights for every user to make better and faster decisions. TARGIT Decision Suite is the only business intelligence platform that offers visual data discovery tools, self-service business analytics, reporting, and stunning dashboards in a single, integrated solution. TARGIT Decision Suite Reviews Recently Reviewed! Comments: When I show Targit to users, they're wowed instantly by its usefulness. The ability to click on an element of one object to dynamically filter other objects on a page allows me to build tremendously useful reports that I could not do with any of the other applications that we evaluated. The degree of control you have over who sees what information is as granular as you could want, yet the interface for maintaining these controls is incredibly simple and easy to use. We've heard nothing but good things from our users, and more people ask for a license all the time. Pros: The breadth of data sources it can use is impressive. The software is super fast and easy to use. It's easy to train new users and to manage who sees what information. Building a new report and disseminating it will frequently take me less than 10 minutes compared to at least an hour using SQL and Excel. The latest version (2017) has some new charts and a much cleaner interface than the 2015 version. Cons: Some of the add-ons cost more than I think they should, and some ought to just be included with the software IMO. There are a couple quirks about how data labels are displayed in charts, but it affects a small percentage of cases and is probably only noticed by a handful of people. Building certain types of objects and reports is a little more cumbersome or counter-intuitive than I'd like, but not so much so that I won't use them because it doesn't change the experience for the end user. Recommendations to other buyers: Spend as much time scoping out your requirements as possible. There were certain fields and tables we should have brought in to the solution during implementation, and while it's always possible to add them in after the fact, it's just easier to do during implementation. My other recommendation is that our approach during launch was not to convert all of our existing Excel reports to Targit (instead we chose to mostly focus on new reports), but in hindsight I don't think that was the best idea because it keeps employees in this state where they have to bounce back and forth between Targit and Excel for their reports. It would be best if employees could just stay inside Targit. Pros: TARGIT was imposed upon me by HQ. As a sales opps manager I'm reposonsible for all sales reporting. TARGIT is an extremely powerful tool allowing for data manipulation in several different ways. From reports to charts to maps you can produce an infinite number of KPIs in seconds which allow for others to easily digest the data. TARGIT connects to CRM and ERP software so users can pull data from just about any other platform they use. The cross tabs are interactive so filtering and drill downs are extremely easy. Cons: The only con I might have is the limited user resources there is. TARGIT is not the easiest tool to become accustom to but once you have it down it's limitless. Overall: Business KPIs are a breeze with TARGIT. 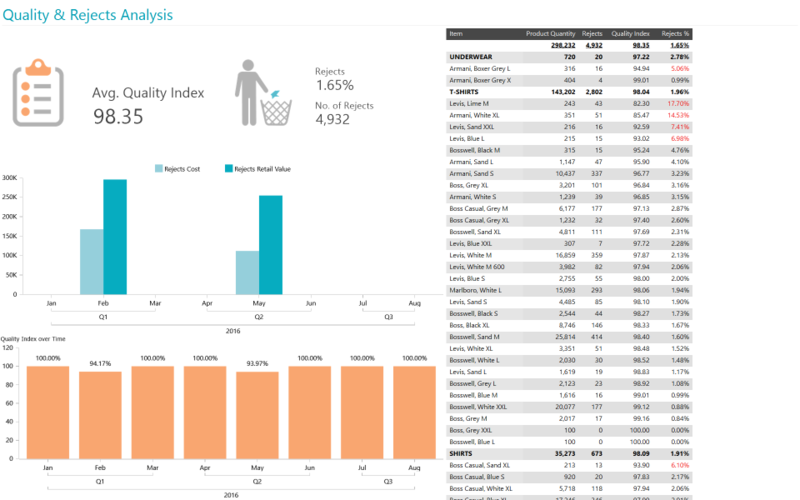 I'm able to build a report which can be refreshed in seconds with updated data anytime I log in. Comments: The Targit customer service, training, and technical team are very helpful and responsive. The product continues to improve. Pros: From a value perspective, you will not find a better performing tool for the $$$. Our dashboard users can quickly view information and drill for more detail through a web client and our power users can generate insightful analysis quickly that can easily be presented via dashboards or PDF slides. Once the initial implementation is complete, the cost to support is negligible. Cons: The biggest drawback of Targit - really the same for all BI platforms - it is not Excel. If you have data integrity problems, you have to address it in the source system. Comments: I have enjoyed working with Ulrik and his team over the past 7 or 8 years. They have always been a great vendor and resource. Pros: I like the ease of use of the product. it is fairly intuitive to use. 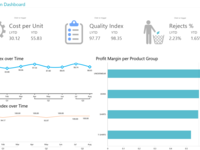 It comes at a very good price point compared to other BI reporting solutions. Cons: I don't like the fact that upgrades are so painful. The upgrades require a significant amount of effort and time. It would be nice if these upgrades had an easier transition to upgrades. Pros: Targit is extremely easy for end users. Generally I can get most users competently doing ad hoc analysis work in Targit with just a few hours of training. Visualization tools good. Dynamic time functionality is an absolute must have for any business. Cons: Some of the ability to get creative with the dashboards are a bit limited. Small issue however since we generally keep it simple anyway. Pros: The ease of use and how quickly the data loads are the main selling points. The ability to link crosstabs and toggle between reports is also extremely useful. Cons: Building custom Calculations and Criteria are complex. Formatting of reports could also be made easier. Pros: The ability to apply granular security down to the dimension level. Ease of connection multiple datasources. Cons: the internal formula engine for creating calculated measures on the client side is somewhat complicated. Love working with the Targit software and people! Pros: Allows us to track a lot of information that we didn't have visibility into before. We now have the ability to monitor data we couldn't before. 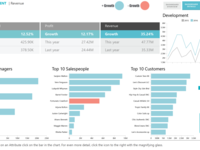 Pros: The drag and drop data points is a very easy way to quickly build a report from scratch. Our group also uses the scheduling function a lot to set up daily or weekly reports. Cons: Building dashboards is a bit cumbersome and TARGIT lacks many of the charts of graphs you typically see in MS Excel. Recommendations to other buyers: Think of the most least technical resources on staff, in our case it was the sales department, and imagine that group attempting to build or quickly review reports. Your BA tool can have all the best features but if it's not easy to use you're just wasting your money. Pros: The product allows an organization's users to easily get familiar how BI Analytics plays a vital role for their company. Helps standardize the reporting needs within an organization and effectively become a more data-driven company. The product is created to try to remove unnecessary complexity that other BI tool providers forget about. Cons: Knowing what we know now we just regret not getting the product sooner. Recommendations to other buyers: Ask all the necessary question you can think of to TARGIT, ask for references that they are willing to furnish. They will demo and schedule a "Proof of Concept" to see the immediate value your company can receive from using the product. Their entire Team is committed to helping you succeed with the use of their product as well as honestly interested in the users feedback to make the product better and more efficient to continue providing the value. 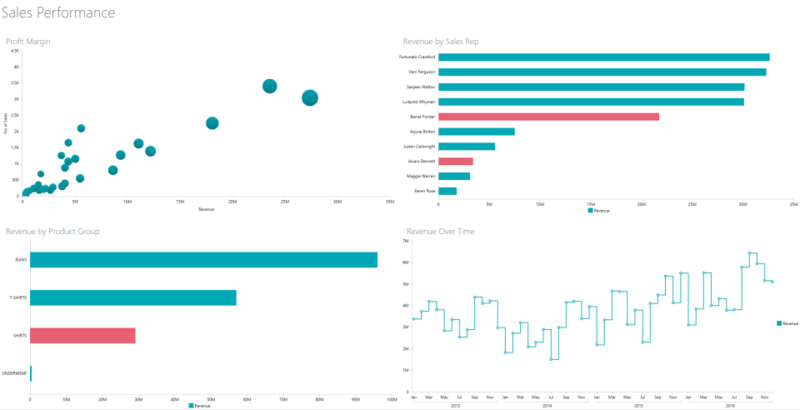 Pros: It's simple to create dashboards and reports. I also like the automatic correlations between objects and facility and quickness to create an analysis. Cons: Advanced calculated measures are not intuitive. Some customization on the reports is not so easy like the analysis. Recommendations to other buyers: Try it. The product can be suitable for many contexts. Pros: TARGIT allows me to look at my business in a few different ways. I use it by checking product spend history, product trends, and areas where I have lost sales. Cons: My company does not provide training on how to use the product. Recommendations to other buyers: If you try it, you will be hooked. You have to navigate around it and you will be impressed! Pros: Ease of use for whatbthevproduct does for you. Helps our recruitment. The numbers are really increasing because of this. Cons: Support, the support is always kind of slow . Thus is the only advice Inhave for this company. Recommendations to other buyers: The people who use thus should go through slit of training. Pros: Ease of installing and friendly user interface. Vendor is excellent with help and advise. Recommendations to other buyers: Consider your hardware limitations. This is a robust software and needs resources to run at peak. Pros: Very easy to learn and use. You choose which data to see. Nice suite of built in graphical tools. Very customizable Dashboards and Reports. Automated reporting. Very few negatives are found with the software. Often times the Dimension hierarchy can cause an issue with the way you wish your Measures were displayed, but this can be worked around. 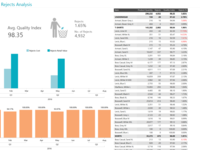 Overall: Condensed only the important data to a manageable view and provides options for manipulating and presenting the data graphically. Pros: What I like most about Targit is that it gathers data that would normally take hours to collect manually, and displays it in any way that the user deems useful. Cons: The only thing I didn't like about using Targit was in designing Reports or Dashboards, there was a good bit of manipulation required to attractively arrange my visual objects. 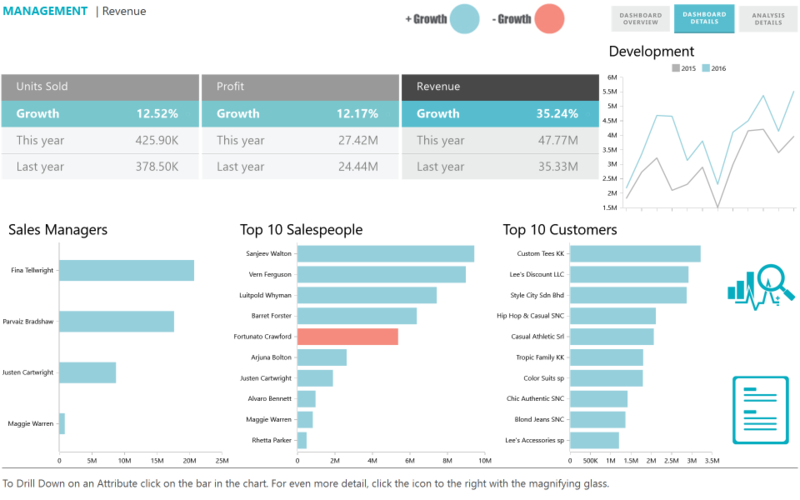 Pros: It's great BI software for quick, easy-to-develop reports and dashboards. It's a stable and reliable platform. The ability to schedule auto-emailed reports is a great feature. Cons: The advanced calculations are difficult to use. The graphs are too basic. There's not enough interaction with other Microsoft applications and not enough custom tools for reports design. Recommendations to other buyers: If you plan on using small to medium sized reports (less than 500 lines), TARGIT is a fine application. If you are looking for an in-depth large metric board, then I would pass. Comments: Targit creates reports with ease. Dashboard /storyboards are a great tool. However they have included a Webserver (the Touchserver) that is not stable. If you want a iPad/SmartTV to show a Dashboards 24x7 without user interference, forget it. Multiple times a day you need to manually refresh. Customer support could not find anything (or was not willing to find anything) and suggested to work with PC and a native Targit client. That works however the costs are greater and there is an extra component which I really do not need. Pros: The Targit BI Suite is a simple and powerful tool that makes it easy to visualise and analyse datasets. The dynamic user interface makes it easy to slice, dice and drill through the data. The Targit BI Suite has helped us getting a better overview of our information and identifying issues, thus leading to better data quality. Cons: The licensing structure is not very intuitive. Not easy for NET users to share and export analysis. 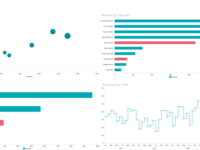 Overall: A powerful data visualisation and analysis tool. very user friendly front end. Overall: would highly recommend this product. we have been using it or a version of it for almost 4 years and have been very pleased with the results. Handy if you know what you're looking for. Pros: Once you know it, it can be very helpful at providing data quickly. Cons: It's not intuitive, like Microsoft. Your first few clicks seemingly are never right. Moreover, you are at risk of making costly mistakes and loosing work easily. Recommendations to other buyers: Train a few power users to be super users for the rest. The power users then can create reports for the population. 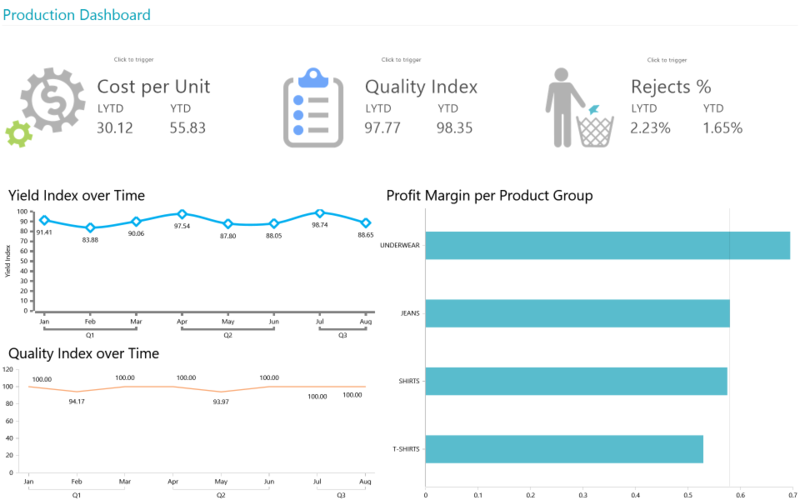 Overall: Make better decisions faster, improve operations, decrease costs and increase income. Instant ROI thanks to the fast implementation and the standardized, easy-to-use software. Pros: I like the easy to navigate user front-end. Cons: The graph/chart formatting is lacking in options. License costs can mount quickly. Recommendations to other buyers: I would recommend that you make sure to review any data collection wizards. TARGIT has proven to be a very effective tool for our leadership team. Pros: They have a very supportive customer service team. Cons: Nothing negative at this time. Our experience has been very positive up to this point. Recommendations to other buyers: The need to make sure you have a solid understanding of how your data will be structured within the cubes that will feed into the product. This will help as you begin to establish the metrics and dash boards within TARGIT. Overall: My preferred BI Tool for visualization. Pros: Easy to use, requires little education. Pros: the user interface is very nice. reports are very easy to produce. their team is very kind, great to work with. Comments: Incredible customer service support. It is second to none. I use this for my small business and it is excellent. It was a little tricky at first understanding how the input data needs to be entered. But after that the dashboards couldn't be easier or more useful!